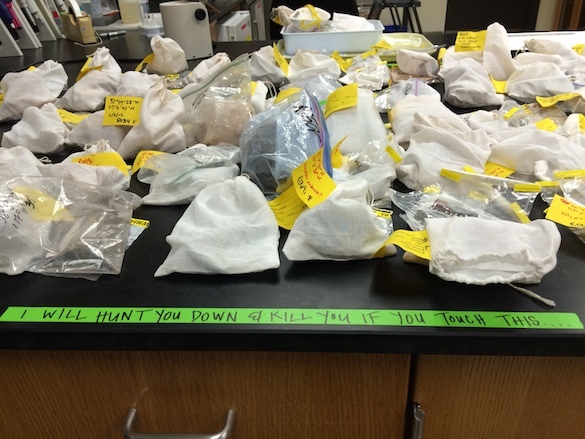 San Diego, CA – Wooster Geologists don’t waste any time getting to work on their summer research. Amineh AlBashaireh (’18) and I have made our way to the University of San Diego to start on a new research project with our collaborators in the Department of Environmental and Ocean Sciences. Our trip began with a tour of the department’s facilities in the impressive Shiley Center for Science and Technology. 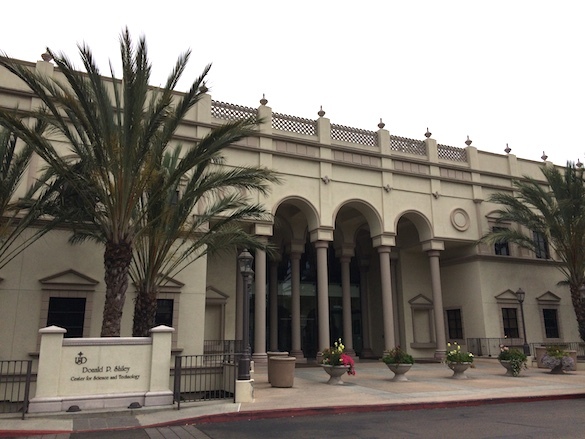 The grand and welcoming entrance to the Shiley Center, which houses USD’s science programs. 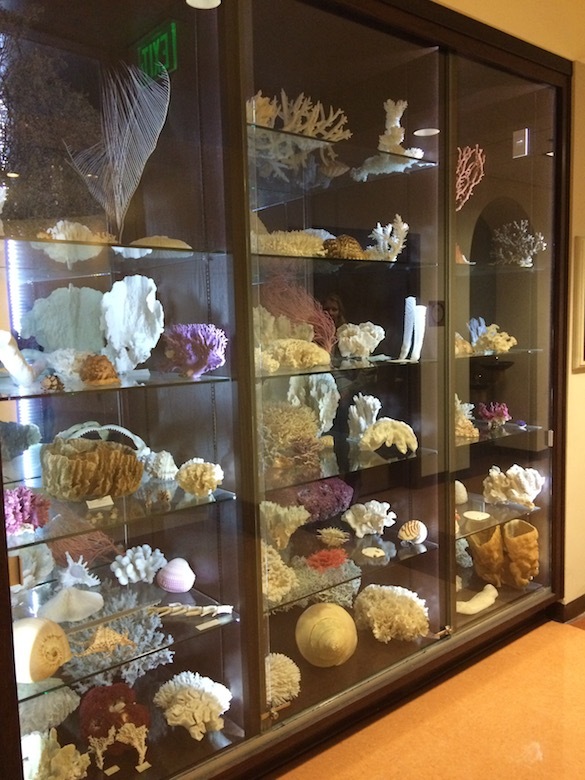 Visitors to the Department of Environmental and Ocean Sciences are greeted with this stunning display of a donated coral collection. A favorite lunch spot is the Strata Plaza. 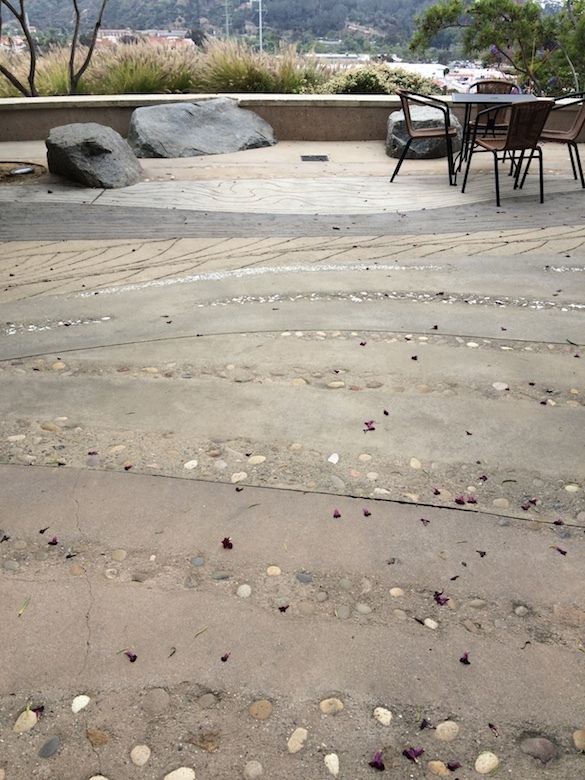 The plaza was designed to represent the local stratigraphy and includes regional fossils, stones, and shells. Our tour ended in the lab, where Dr. Bethany O’Shea and her graduate student, Elizabeth Johnston, gave us an overview of their work. Looks like they mean business! We’re looking forward to a full week of field and lab work. Stay tuned for more posts from sunny San Diego! We are fortunate at Wooster to have a few fossils from the Burgess Shale (Middle Cambrian) collected near Burgess Pass, British Columbia, Canada, including this delicate phyllocarid Canadaspis perfecta (Walcott, 1912). This species is one of the oldest crustaceans, a group that includes barnacles, crabs, lobsters and shrimp. Please note from the start that I did NOT collect it. 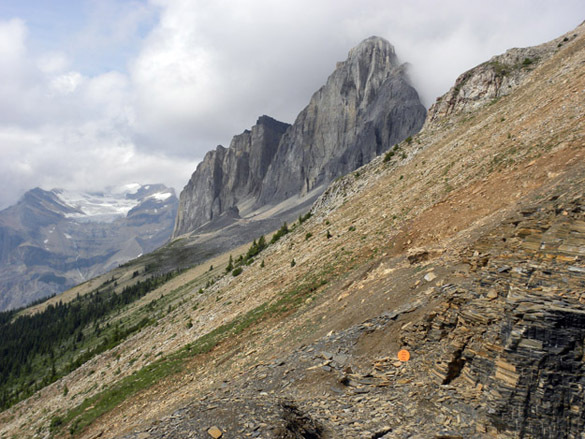 The Burgess Shale is a UNESCO World Heritage Site, so collecting there is restricted to a very small group of paleontologists who have gone through probably the most strict permitting system anywhere. I had a wonderful visit to the Burgess Shale with my friend Matthew James in 2009, and we followed all the rules. (The photo below is of the Walcott Quarry outcrop.) Our Wooster specimen was in our teaching collection when I arrived. I suspect it was collected in the 1920s or 1930s and probably purchased from a scientific supply house. Such a dramatic setting, which is perfect for the incredible fossils that have come from this site. 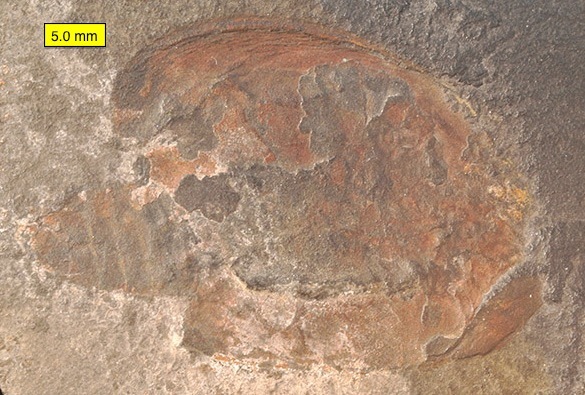 Canadaspis perfecta has been thoroughly studied by Derek Briggs, the most prominent of the paleontologists who have studied the Burgess Shale fauna. The above reconstruction of C. perfecta is from his classic 1978 monograph on the species. He had spectacular material to work with, including specimens with limbs and antennae well represented. Our specimen is a bit shabby in comparison! Nevertheless, we can still make out abdominal segments and a bit of the head shield. Briggs (1978, p. 440) concluded that C. perfecta likely “fed on coarse particles, possibly with the aid of currents set up by the biramous appendages”. This is a similar feeding mode to many of the trilobites who lived alongside. Briggs, D.E. 1978. 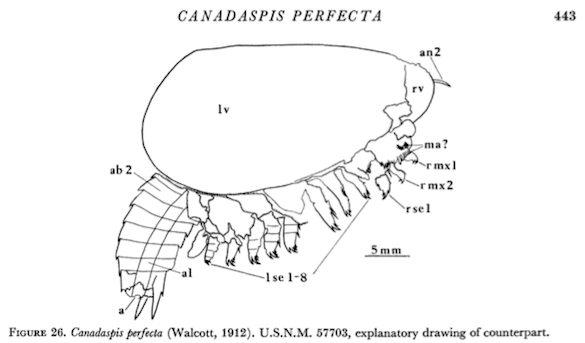 The morphology, mode of life, and affinities of Canadaspis perfecta (Crustacea: Phyllocarida), Middle Cambrian, Burgess Shale, British Columbia. Philosophical Transactions of the Royal Society of London. Series B, Biological Sciences 281: 439-487. Briggs, D.E. 1992. Phylogenetic significance of the Burgess Shale crustacean Canadaspis. Acta Zoologica 73: 293-300.